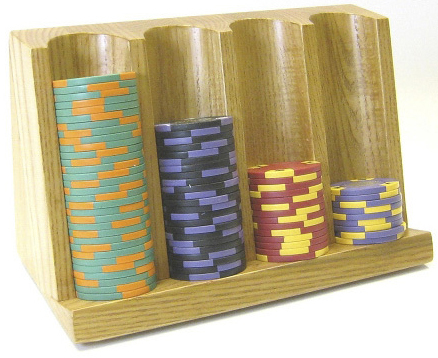 This is our 160 Chip Vertical Wood Craps Chip Tray used primarily on craps tables. This tray is made of a solid beautifully finished hardwood. It holds 4 rows of 40 chips each for a total of 160 professional size chips. This will compliment any craps table with a truly professional look. If needing a larger craps tray see our 10 row 500 chip tray. Dimensions are 8 1/8 in. length x 5 in. height x 3 3/4 in. base.